Maenarthur Trail at Ystwyth Forest (NRW)0300 065 3000work Walking RouteMaenarthur Trail (2.5 miles, 4 kilometres). 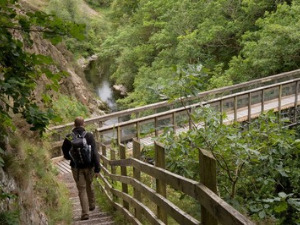 Follow some of the original miners' paths around this attractive woodland and discover the Castle Grogwynion Iron Age Hillfort, the Grogwynion Falls, an amazing variety of trees, and a dam dating from the 19th Century. You can see evidence of humanity's activities spanning thousands of years in Coed Maenarthur. 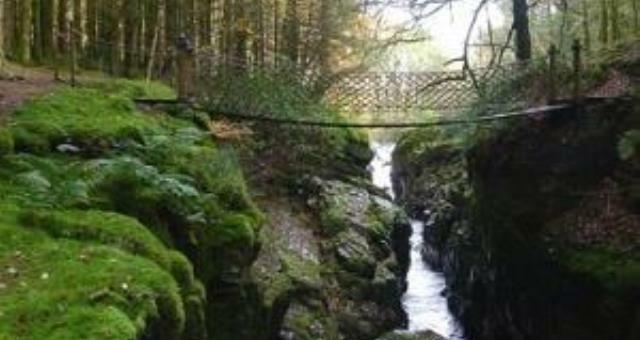 The Iron Age Hillfort, the legend of King Arthur, the Afon Ystwyth and more recently lead mining and forestry, have all played an important role in shaping this woodland. From Aberystwyth follow the B4340 to Trawsgoed. Follow this road through Trawsgoed until the road crosses the Afon Ystwyth and turn immediately left, following the river towards Pontrhydygroes. Park sensitively on the left by the Miners’ Bridge (opposite the mill wheel) as you come into Pontrhydygroes village. Go through the footpath gate to get to the walk. Maenarthur Trail (2.5 miles, 4 kilometres).